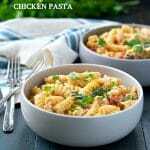 Creamy, comforting and delicious, this creamy Tuscan chicken pasta is super easy to prepare and comes together in under 1 hour. In a large 13 x 9-inch baking dish, stir together uncooked pasta, Alfredo sauce, chicken broth, chicken, garlic, red peppers, and sun-dried tomatoes. Cover tightly with aluminum foil and bake for 35 minutes. Once pasta is al dente, stir in the fresh spinach. The spinach will wilt almost instantly as you stir it into the hot pasta. Sprinkle mozzarella over the top. Bake uncovered for 10 more minutes (or until cheese is melted and pasta is tender). Garnish with freshly grated Parmesan or fresh chopped herbs, if desired. Cooking for a Smaller Crowd? You can cut the ingredients in half and bake the pasta in an 8-inch or 9-inch square dish. Want to Prep Ahead? Prepare the dish to Step 2 -- cover with foil and keep in the refrigerator until you're ready to bake it later.